Millions of automobile accidents occur worldwide each year. Some of the most serious are rear-end crashes, side crashes within intersections, and crashes that occur when cars change lanes or drift into a lane. The holy grail of traffic safety is to avoid automobile accidents altogether. To that end, major automakers, governments, and universities are working on systems that allow vehicles to communicate with one another as well as the surrounding infrastructure (V2V/V2I for short). These systems show promise for such functions as intersection assist, left-turn assist, do-not-pass warning, advance warning of a vehicle braking ahead, forward-collision warning, and blind-spot/lane-change warning. This compendium explores the challenges in developing these systems and provides the latest developments in V2V/V2I technology. It begins with a series of overview news stories and articles from SAE’s magazines on the progress in this technology. This is followed by a series of technical papers on V2V/V2I dealing with the many technical aspects of design of these systems as well as discussions of such key issues as the need for extreme reliability assurances and traffic congestion overloads on the systems. Some of most interesting discussions in the book include: •	Overview of a large-scale test in Germany to address reliability. •	Effectiveness of different antennas and receivers that are used in various intersections settings, such as intersections where there are tall buildings or no buildings, and where high transmission power lines are located that can cause signal interference. •	Various ways to communicate between vehicles and how messages are relayed to drivers. •	Dedicated short range communication protocol for vehicle safety applications, which shows promise for combining and processing large amounts of information. Editor Ronald K. Jurgen prepared this book to be of use to engineers at automakers and electronic component suppliers; software engineers; computer systems analysts and architects; academics and researchers within the electronics, computing, and automotive industries; legislators, managers and other decision-makers in the government highway sector; traffic safety professionals; and insurance and legal practitioners. Mr. Jurgen served on the editorial staff of IEEE Spectrum for 30 years and is the editor of several electronics-related handbooks and several other electronics-related compendiums published by SAE International. 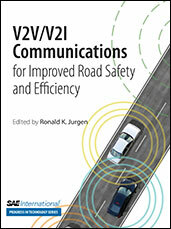 If you do not have access to SAE MOBILUS via username/password or institutional access, you can still purchase the Progress In Technology (PT), V2V/V2I Communications for Improved Road Safety and Efficiency.